If you were wondering how The Walking Dead would top its ridiculous screwdriver-perforated zombie head Blu-ray packaging from season two, wonder no longer! 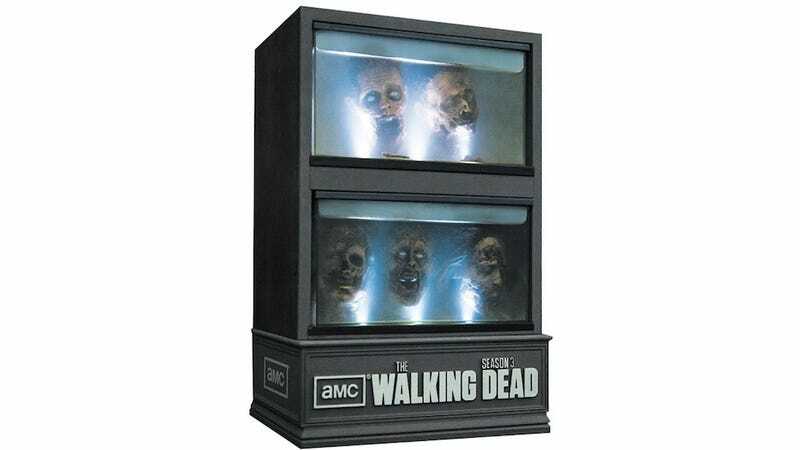 Turns out $105 will get you season three of the show and a small replica of one of the Governor's many, many severed head-filled aquariums! I have to say I kind of approve. It appears to have lights in it, so that's a nice touch. More importantly, it's just a tad more subtle than the rubber zombie head, so it'll look a hell of a lot nicer on your media shelf (so to speak). With any luck, it'll actually be water-tight, and we can put sea monkeys in there.